I just purchased Object Desktop software and installed everything. I then rebooted. Now when I right click, or try and click left button while dragging a window, I don't get any response on the screen. I can't seem to get icons to change using iconpackager… just says it changes and yet nothing does..
Also, I have windows 10 education.. Sorry to hear you are having issues. Please try unlock Fences. 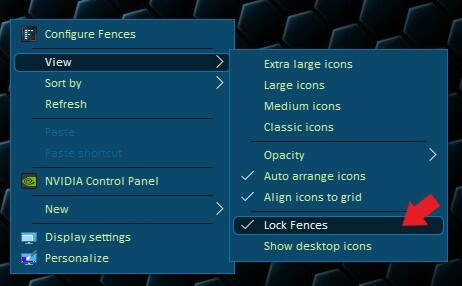 Right click anywhere on desktop -> View -> Lock Fences <-un-select it. Try that first and let us know. thanks for the reply, I can't even right click, the window doesn't appear. Need more clear explanation. Just "window doesn't appear". Windows 10 don't load? I cannot interact with the desktop. menu doesn't pop up when I click the right mouse button. I can use start button to execute programs. I went to Fences and didn't see anything about unlocking or locking. Not really sure what else I can say. Just happened after installing object desktop. I had fences already thru steam, maybe I should uninstall it and install again? You said, you've installed everything? Maybe you should uninstall everything and Start again one at a time. What you should do is. 1) Uninstall everything that listed on ODM. Reboot. 2) See if everything back to normal as before. 3) Install one of Program. For example, Windowblinds. 4) Reboot. and Test. Apply some theme and see if it okay. Than move on to install others such as Fences, Groupy etc etc. Remember to reboot and test out everytime after you install one software. Its not necessary, but it is advisable to do so. I'm upset a little.. I just don't have time for this.. I like the software and company. The software had option for downloading and installing everything.. now I'm supposed to uninstall it all and try one at a time to find out which one screwed up my computer.. Please someone help me solve this? Someone must have the same problem when installing object desktop software..
Ok, just to update, I uninstalled everything and rebooted, and it still won't work... right clicking on desktop is not working.. it happened only after installing software from stardock. Very frustrated, please help me with advice on how to fix computer.. If you have no Stardock software installed at all, it would be VERY unlikely that it is the result of having any of it (the suite) ever installed. Ok, I figured it out, I'm confident that installing the object desktop somehow affected my NVIDIA control panel. I couldn't right click to view it. I downloaded and reinstalled my graphics drivers with clean install, I don't know why, all I know is it works now. Please let me know what you think.. I love the software though, my computer looks better with it. Is it possible for the install to affect my video card drivers? I would normally say no, but I can't figure it out.. I'm confident that installing the object desktop somehow affected my NVIDIA control panel. It's not the first time we have read that NVidia's 'features' cause an issue. ugh... so I fixed it yesterday, now today after rebooting it not working again.. You guys have any idea why NVIDIA and Object Desktop don't like each other? I don't wanna delete your software, but I might have too if my computer doesn't run properly..
You guys have any idea why NVIDIA and Object Desktop don't like each other? Object Desktop is not software, its a collection of. That said, if I had to venture a guess, it is not liking Fences. What I would suggest is turning of any 'overlay' that Nvidia is producing. Also, any actively running Nvidia software is largely unnecessary. Other than its '3D Vision' product, it's uses are for reminding of updates and perhaps some video capture / gaming components. I have had fences on here for like 1 year without an issue... only since I bought object and installed an update did I have problems.. I will try what you say, worked before with fences I had purchased through steam. Ok, so GeForce experience and the nvidia drivers seem to be uninstalled somehow automatically... I installed drivers for nvidia and it fixed problem again.. I not sure why its auto uninstalling or disabling.. I might have same problem when I reboot again. I gonna disable any overlay and see if it helps..